Imagine yourself as a raindrop. It is the year 10 Rabbit. You have been blown from the eastern huey ahuecatlan by hurricane winds, sent by Tlaloc, the god of rain. You have fallen to earth in the mountains of Ajusco, at the southern end of the basin of Mexico. By force of gravity, you and countless thousands of your brethren cascade down the terraced slopes and over the milpan, then slip underground, only to be thrust back to the surface in mountain springs. Reunited, you and your brethren flow north, through streams that feed into Lakes Chalco and Xochimilco. But this is far from the end of your journey. After gently flowing through myriad of channels between chinampan, you, like your brethren in Lakes Zumpango and Xaltocan far to the north, head toward your final destination: Lake Texcoco, the largest and lowest of the basin lakes. On the way, you pass through one, maybe more, of the one million human bodies who depend on you and your brethren for life, as well as various other mammals, birds, and aquatic organisms. Once at the basin floor, you are reunited with yet more recent arrivals from springs and rivers who were lucky enough not to be trapped in the aquifers beneath the basin floor. Unlike your previous journeys to the basin of Mexico, where you had been free to move about the expansive lake, there is now a wall (a dike) separating you from your elder brethren in the brackish waters to the east. Numerous canoes pass overhead, while whitefish dart to your side. You are now in Lake Mexico, artificially divided from Texcoco by the earthen walls, which are also roads to a young island city named Tenochtitlan. You pass through the canals of the city, which teem with aquatic vegetation and into which are deposited human and animal refuse. Eventually, during the flood that Ahuizotl brought upon the city, you flow over the walls and arrive in Texcoco. And there, under the full sun of the sub-tropics, you await your ascension back to the heavens through evaporation, for that is the only escape. It is 1636 AD. You have made the journey once again from the Caribbean by hurricane winds, this time sent by the intercession of Our Lady of Remedios. There are far fewer human bodies to pass through on this trip, yet those lost have been replaced by strange new animals—horses, cattle, sheep, goats, cats, chickens, pigs, and others. Only seven years before, Mexico City, the city that replaced Tenochtitlan, was covered with more than a vara of water in a single night. Despite the protestations of the Archbishop, who demanded they leave, and of the Virgin of Guadalupe, whose image was paraded in boats across the city in hopes of driving them away, the legions of your brethren sent that night stayed for five years. You fall this time on the slopes of the Sierra de Monte Bajo, at the northwestern end of the basin. You rush down the mountain slopes, and enter the fast-flowing current of the Cuautitlán River. Unlike countless times before, however, Lake Texcoco will not be your final destination. Thirty years before your arrival, a clever man named Enrico Martínez had blocked your path. You arrive in Lake Zumpango, the highest of the northern lakes, only to be diverted into a canal and then a tunnel, heading north, away from Texcoco. Once through the tunnel—which is almost completely blocked by cave-ins and takes some time to traverse—and exposed again to the light of day, you behold a landscape you and your brethren rarely visit. This is the Mezquital valley, an arid landscape of brush and cacti. In this region, itself an inland sea millennia ago, you travel along the Tula river, passing by the fabled city of the same name, then on to Mixquiahuala, Ixmiquilpan, and Tasquillo, relatively unhindered by the canals and ditches you are so accustomed to on the far side of the tunnel. Leaving this land, you are deposited into a mighty river, the Pánuco. In a great northeasterly arc, you and your companions flow through valley after valley inhabited by humans whom people to the south call Chichimecs. You conclude your travels with the Pánuco at Tampico, where you are rejoined with the waters that had given you birth—more than 90 leguas or 450,000 varas from where your journey began. 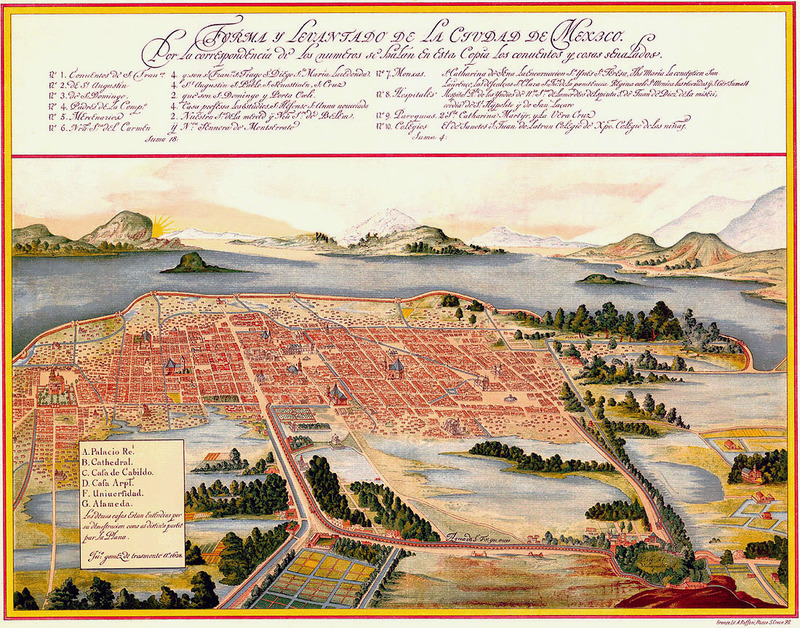 The basin of Mexico, by Juan Gómez de Trasmonte (ca. 1628). It is 2014. This time, you have descended to the earth, not in the basin of Mexico, but in the valley to the west, near the Nevado de Toluca. You are sent by hurricanes propelled by the rotation of the earth and the westerly winds of the Inter-Tropical Convergence Zone, the same phenomenon which produces monsoons on the other side of the world. In this trip, you see little of the surrounding landscape; most of your time is spent in an endless maze of pipes. You are collected in one of a number of dams, and pass through hydroelectric turbines before being pumped a vertical kilometer over the western rim of what is now truly the valley of Mexico. In your descent into the megalopolis, you are forced underground into a network of pipes for potable water, where you have a 2 in 5 chance to be leaked into the surrounding soil, but only a 9 in 100 chance of receiving treatment. Your escape can happen anywhere along the thousands of kilometers of pipe under the sinking city, but the risk is highest to the east, where much of the city’s poor have colonized what was once yours: Lake Texcoco. Gone are the cattle and livestock. Gone are the fields of wheat and maguey that once covered most of the basin floor. 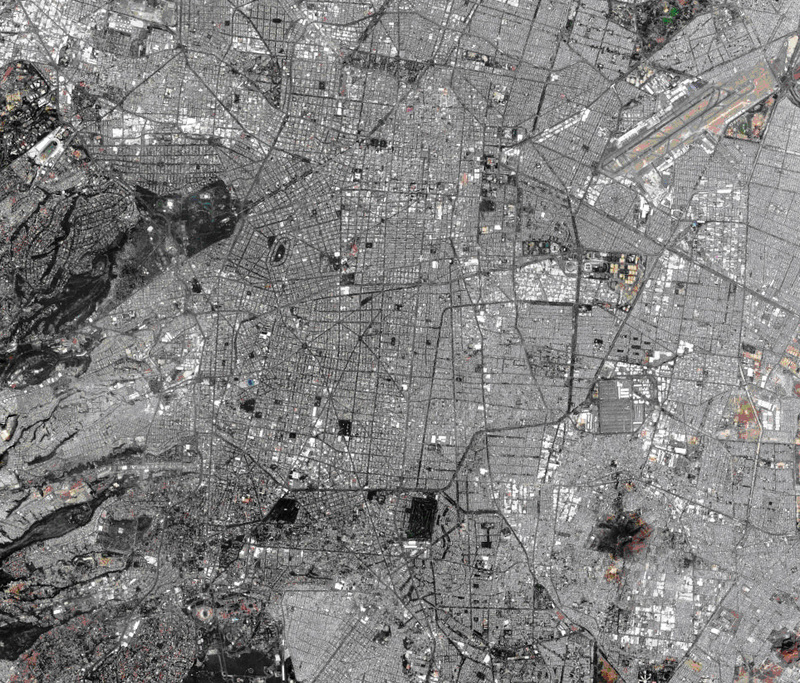 The lakes, except for mere vestiges of Xochimilco, Chalco, Texcoco, and Zumpango, are gone as well. They have been replaced by 20 million human bodies, and hundreds of thousands of dogs, cats, and other pets, all living in a city of concrete. You might pass through some of the chilangos and mexiquenses who constitute 17 percent of the country’s population or any number of industrial plants. When you leave the valley, you head north, once again to the Mezquital, and pass through one of several massive drainage pipes or the Gran Canal, now intubated, on your way. Laden with human waste, heavy metals, and pharmaceutical compounds, you are derided as “black” water. Except when you and your brethren come in numbers to remind the city’s denizens that once you were once lords of the bottomlands, you are mostly ignored—out of sight and out of mind. In the Mezquital, you pass through yet more dams and canals to irrigate the crops that depend upon your arrival. Drifting through the largest such system the world has known, you, your friends, and the human waste you buoy are about to give life to alfalfa, chiles, cilantro, and other crops to be sold in the city you have just left. Afterward, some of you finally make it to the Pánuco, as it has been for centuries, but many more become trapped in the aquifers below. Your particular journey, however, has just begun. You and the pharmaceutical compounds along for the ride are absorbed into the roots of an alfalfa plant. You are then harvested, transported, and fed to a cow in a stock pen, perhaps owned by Lala or Nestlé. Once ingested, you and your non-soluble companions pass through the cow, and into the milk, which is bottled and shipped to Mexico City, ready to be drunk. Soon, your northward journey will begin again. Imagina que eres una gota de lluvia. Es el año 10 Conejo. Has sido transportada desde el huey ahuecatlan oriental por vientos huracanados, enviada por Tlaloc, el dios de la lluvia. Has descendido a la tierra en las montañas del Ajusco, en la orilla meridional de la cuenca de México. Por la fuerza de la gravedad, tú y tus incontables hermanas caen en cascada por pendientes y sobre las milpan, luego se deslizan por el subsuelo sólo para volver a la superficie en forma de manantiales montañosos. Reunidas, tú y tus hermanas fluyen hacia el norte a través de los arroyos que alimentan los lagos de Chalco y Xochimilco. Pero el final de tú viaje aún está lejos. Después de fluir gentilmente a través de múltiples canales entre chinampan, tú, al igual que tus hermanas en los lagos de Zumpango y Xaltocan más al norte, te diriges hacia tu destino final: el lago de Texcoco, el más grande y menos profundo de los lagos de la cuenca. En tu camino, pasas por uno, tal vez más, del millón de cuerpos humanos que dependen de ti y tus hermanas para vivir, así como otros muchos mamíferos, pájaros y organismos acuáticos. Una vez en la superficie de la cuenca, te reúnes con aún más flujos frescos provenientes de manantiales y ríos que fueron lo suficientemente afortunados para no quedar atrapados en los mantos acuíferos subterráneos de la cuenca. A diferencia de tus otros viajes a la cuenca de México, en los que habías podido desplazarte a través del inmenso lago, hay ahora un muro (un dique) que te separa de tus hermanas más antiguas en las aguas salobres hacia el oriente. Numerosas canoas pasan por encima de ti, mientras que peces blancos corren por tu lado. Estás ahora en el lago de México, artificialmente separado del de Texcoco por muros de tierra que también sirven de camino para llegar a una joven ciudad isleña llamada Tenochtitlan. Pasas por las acequias de la ciudad, abundantes en vegetación acuática y en los que desechos humanos y de otros animales son depositados. Con el tiempo, durante la inundación que Ahuizotl trajo a la ciudad, fluyes por encima de los muros y arribas a Texcoco. Y ahí, bajo el pleno sol subtropical, esperas tu ascenso de nuevo al cielo por medio de la evaporación. Ésa es la única salida de la cuenca. Reconstrucción artística de Tomás Filsinger. Es el año año del señor de 1636. Has vuelto a hacer el viaje desde el Caribe traída por los vientos de los huracanes, esta vez enviada por la intercesión de Nuestra Señora de los Remedios. Hay menos cuerpos humanos por los cuales pasar en este viaje, pero aquellos que ya no están han sido reemplazados por nuevos y extraños animales: caballos, reses, ovejas, cabras, gatos, gallinas, cerdos y otros. 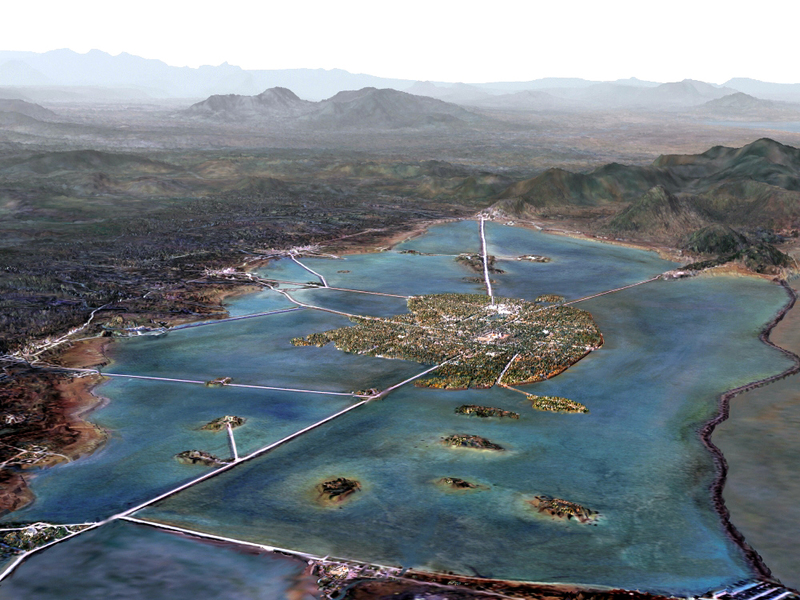 Tan sólo siete años antes, la ciudad de México, ciudad que reemplazó a Tenochtitlan, fue cubierta por más de una vara de agua en una sola noche. A pesar de las protestas del arzobispo, quien exigió que se fueran, y de la Virgen de Guadalupe, cuya imagen desfiló en botes por la ciudad con la esperanza de alejarlas, legiones de gotas enviadas aquella noche se quedaron por cinco años. Esta vez caíste en las laderas de la sierra de Monte Bajo, en la orilla noroccidental de la cuenca. Desciendes por las laderas de la montaña y entras en la vertiginosa corriente del río Cuautitlán. Sin embargo, a diferencia de muchas otras veces anteriores, el lago de Texcoco no será tu destino final. Treinta años antes de tu llegada, un ingenioso hombre llamado Enrico Martínez bloqueó tu camino. Llegas al lago Zumpango, el más alto de los lagos al norte de la cuenca , sólo para ser desviada hacia un tajo y luego un túnel, con dirección al norte, lejos de Texcoco. Una vez en el túnel —el cual está casi completamente obstruido por derrumbes que a veces te toma algún tiempo atravesar— y expuesta de nuevo a la luz del día, observas un paisaje que tú y tus hermanas rara vez visitan. Éste es el valle del Mezquital, un paisaje árido de matorrales y cactus. En esta región, un mar interior milenios atrás, viajas por el río Tula, pasando por la legendaria ciudad del mismo nombre, luego hacia Mixquiahuala, Ixmiquilpan, y Tasquillo, relativamente sin ser obstaculizada por los canales y zanjas a los que estás tan acostumbrada a un lado del túnel. Al dejar estas tierras, eres depositada en un poderoso río, el Pánuco. En un gran arco nororiental, tú y tus compañeras fluyen a través de valle tras valle habitados todos por humanos a quienes la gente en el sur llaman chichimecas. Concluyes tu travesía por el Pánuco en Tampico, donde te reúnes con las aguas que te habían dado nacimiento —a más de 90 leguas 450 mil varas de donde comenzó tu viaje. Es 2014. Esta vez has descendido a la tierra no en la cuenca de México, sino en el valle al oeste, cerca del Nevado de Toluca. Fuiste traída por huracanes propulsados por la rotación de la tierra y los vientos occidentales de la zona de convergencia intertropical, el mismo fenómeno que produce los monzones al otro lado del mundo. En este viaje ves muy poco del paisaje circundante; la mayoría de tu tiempo lo pasa en interminables, laberínticas tuberías. Has sido recogida en una de varias presas, y pasas a través de turbinas hidroeléctricas antes de ser bombeada un kilómetro más arriba, sobre el borde occidental del que ahora es en verdad el valle de México. En tu descenso a la megalópolis, eres empujada al subsuelo dentro de una red de tubos de agua potable en donde tienes dos de cinco probabilidades de gotear en el suelo circundante, pero sólo nueve de cien de recibir tratamiento. Tu escape puede suceder en cualquier punto a lo largo de miles de kilómetros de tubos bajo la ciudad que se hunde, pero el riesgo es más alto hacia el este, en donde muchos de los pobres de la ciudad han colonizado lo que antes era tuyo: el lago de Texcoco. El ganado se ha ido. Los campos de trigo y maguey que alguna vez cubrieron la mayor parte de la superficie de la cuenca se han ido. Los lagos, excepto por meros vestigios de los de Xochimilco, Chalco, Texcoco y Zumpango, también se han ido. Han sido reemplazados por 20 millones de cuerpos y cientos de miles de perros, gatos y otras mascotas; todos viviendo en una ciudad de concreto. Tal vez pases por algunos chilangos y mexiquenses que constituyen alrededor de 17 por ciento de la población del país o por alguna de muchas plantas industriales. Cuando dejas el valle, te diriges hacia el norte, una vez más con rumbo al Mezquital, y pasas a través de una de las enormes tubos de drenaje o el gran canal del desagüe, ahora entubado, en tu camino. Cargada de desechos humanos, metales pesados y compuestos farmacéuticos, eres estigmatizada como agua “negra”. Sólo cuando tú y tus hermanas arriban en grandes cantidades para recordar a los moradores de la ciudad que alguna vez fueron señores de las tierras bajas, eres en mayor parte ignorada —ojos que no ven, corazón que no siente—. En el Mezquital, pasas todavía por más presas y canales para irrigar los cultivos que dependen de tu llegada. A la deriva en el sistema más grande de su tipo que haya conocido el mundo, tú, tus amigas y los desechos humanos que mantienes a flote están a punto de dar vida a cultivos como alfalfa, chile y cilantro que serán vendidos en la ciudad que acabas de dejar. Después, algunas de ustedes finalmente logran llegar al Pánuco, como ha sucedido por siglos, pero muchas más quedan atrapadas en los acuíferos abajo. Tu singular viaje, sin embargo, apenas ha comenzado. Tú y los compuestos farmacéuticos que también hacen el viaje son absorbidos por las raíces de una planta de alfalfa. Eres cosechada, transportada y dada en alimento a una vaca en una estancia de ganado, tal vez propiedad de Lala o de Nestlé. Una vez digerida, tú y tus compañeros no solubles pasan por la vaca y a la leche, la cual es embotellada y enviada a la ciudad de México, lista para ser bebida. Pronto, tu viaje con dirección al norte comenzará una vez más.